If a person passes with a will, the person died “Testate”. If a person passes without a will, the person died “Intestate”. Decedent is the person who is deceased. Probate is a court supervised process for identifying and gathering the assets of a deceased person (decedent), paying decedent’s debts, and distributing the decedent’s assets to his or her beneficiaries. Generally, the decedent’s assets are used to pay the cost of probate proceedings, followed by decedent’s debts and the remainder to decedent’s beneficiaries. Probate is the process used to pass ownership of decedent’s probate assets to the beneficiaries. If the decedent has a valid will it is to be presented to the court to effectively pass ownership. If the decedent had no will, probate is a tool used to pass ownership of decedent’s probate assets. Additionally, probate winds up the decedent’s financial affairs after his or her death, when properly executed. A will is a written document, signed by the decedent and witnessed, that meets the requirements of Illinois law. 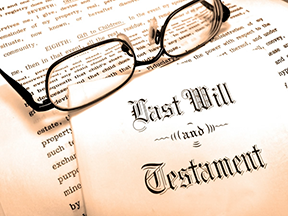 In the will the decedent can name beneficiaries and designate a personal representatives (“Executor” in Illinois). If decedent has a valid will, the will controls over the Illinois default provisions. If not valid, then Illinois default provision law may prevail.